Home » Blog » Is It A Good Idea To Get A Credit Card During Bankruptcy? UPDATE: Since this podcast was recorded, Affirm Financial Services has discontinued offering credit cards to people in an active bankruptcy in most cases, so the information in this podcast is for general information only about secured credit cards. If you are looking for a secured credit card AFTER your bankruptcy is complete, an option is a Secured Home Trust Visa Card. Today we look at card options for those with damaged credit, specifically a secured credit card. 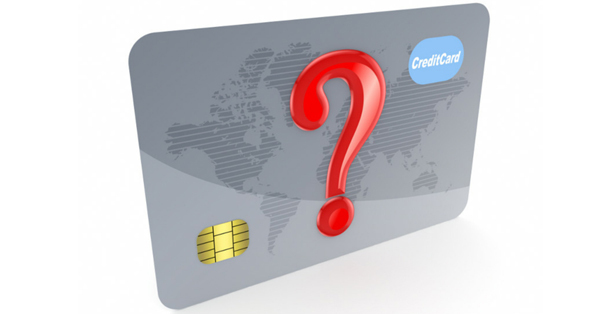 What does a secured credit card offer? One of the biggest worries people have about filing bankruptcy or a consumer proposal is the loss of their credit cards and their credit history. An option for many of our clients to to apply for a secured credit card. Like any credit card, a secured credit card is a transaction based card so you use it for daily transactions like renting a car, booking a hotel, buying something online. A secured credit card is a real credit card, with real credit limits and is reported to the credit bureaus meaning using the card (wisely) can help you rebuild your credit. By using a secured card, and paying your balance off each month, you begin the process of re-establishing your credit. No one outside of the credit bureaus knows the formula that goes into generating a credit rating, but some areas that are taken into consideration include the length of time you’ve had credit, your payment history and how long that history is, demographic information, recent inquiries made by financial institutions and the utilization of credit. Having a credit card and using it wisely are good ways to begin the process of rebuilding credit. So how much credit do you need? Most people get a secured credit card for between $500 a $1,000. That amount is easy to save up during your bankruptcy or proposal and generally provides enough to cover reasonable charges and be able to pay that amount off in full each month. However access to a bigger amount of credit, but only using a small portion of it shows that you’re using that credit responsibly. So should you save up more & apply for a larger limit? It is often over-use of credit cards and build-up of overwhelming credit card debt that lead to financial problems in the first place. Having a higher limit, even though it is secured, still requires you to be able to pay off any balances you charge on the account every month if you really want to start creating better credit card habits. Can you do this if you give yourself a higher limit? Whether you should get a secured credit card, and for how much, is a decision that will have to be made by you based on your specific personal situation. At Hoyes Michalos, we never advise anyone to get a credit card during or right after bankruptcy unless they absolutely need one or they have a future need for good credit. You’ve lived without a credit card during your bankruptcy. It may be possible to continue to do so after your bankruptcy is completed. Replace the high interest card with a less expensive one once you have rebuilt your credit. As I record this show in June 2015, interest rates are at record lows. If you have perfect credit, you can get a conventional mortgage for 3% or even less. With good credit you can still get a car loan at close to zero interest. But what happens if you have less than perfect credit? The answer is that in many cases your only option for credit is through a high interest loan or a high interest credit card. And I can tell you there are lots of lenders willing to lend at high interest rates to people with less than perfect credit. When I started out in the debt help business 25 years ago the big players were the finance companies, many of whom no longer exist. Today it’s not the finance companies that dominate the market. If you have poor credit your options are the higher interest lenders including some specialized finance companies, as well as payday loan companies and high interest credit cards. So, what’s the deal on high interest credit cards for people with damaged credit? Are they a good deal or should they be avoided at all costs? To find out I’ve asked a provider of credit cards to people with bad credit to be a guest on the show. Before I introduce him, let me give you my standard disclaimer. The guests on this show, Debt Free in 30, are invited by me because I want to hear their perspective. I don’t just invite people I agree with. I also want to make it clear that I don’t pay any of my guests to appear on the show and none of my guests pay to be on the show. Debt Free in 30 is not a commercial for any of my guests; it’s a forum for my listeners and for me to hear many different points of view. So, with that background let’s get started with today’s guest. Who are you? Where do you work and what do you do? Jim D: Well, thanks for having me Doug. My name is Jim Dunbar. I am the Managing Partner and Chief Commercial officer for Affirm Financial Services. Doug H: So, tell me a bit about Affirm Financial Services, then. That’s obviously not a big bank. Jim D: We are a finance company. We are a Canadian based finance company. We’ve been in market now for a little over four years serving Canadians. We provide consumer loans, term loans and credit card solutions to customers who are not being served by the banks. That’s probably the best way to describe it. Doug H: Great, okay. Well, thanks for being with me here today, Jim. So, let’s talk about the credit card product. As I understand it Affirm Financial has a credit card that you can qualify for even if you’re bankrupt or in a consumer proposal. Is that correct? Jim D: That’s correct. We have designed the product for people that are in bankruptcy or consumer proposal and for those who have been recently discharged. Doug H: Okay. So, and I understand the need for such a thing. And in fact the question I get asked all the time by somebody who’s thinking about going bankrupt is, yeah but if I go bankrupt I know I lose all my credit cards; how am I going to be able to book a hotel room cause I have to travel for work? I give them some advice on how to go about doing that, having family or friends get you a card for example, or have your employer get you one so it’s not really your card, you’re just able to use it. But a lot of people don’t have that option; they don’t have a family or friend who’s willing to give them access to a credit card. So, that’s where a service such as yours comes in. But, obviously there’s some costs associated with that. So, let’s go through the main points of this credit card that you’ve got. So, what’s the credit limit that you offer? And let’s take the case of somebody who is currently bankrupt. Jim D: Well, if somebody is currently in the process and currently bankrupt, the maximum credit limit is $1,000. When someone comes out of bankruptcy and has been discharged, that limit goes as high as $4,000. Doug H: Okay, so during the bankruptcy period $1,000. What security deposit is required on that card? Jim D: That’s a good question. There is no security deposit required on the card. And I think that is probably the most important description here: this is not a prepaid card and this is not a secured card. This is an unsecured credit card; it’s an actual MasterCard that is made available for our customers. Doug H: So, what are the qualifications terms then in order to get this card? Jim D: We do offer this card to people that it’s the first time they’ve been bankrupt. And that they have a source of income. We verify that source of income; we think that ensuring that someone has the capacity to pay back and make the monthly payments is critical, but once that’s been demonstrated we’re able to offer the card. Doug H: So, okay we talked about all the good things. You know, it’s got $1,000 credit limit, even if you’re bankrupt so long as it’s your first bankruptcy. So long as you’ve got a job or a source of income you qualify, there’s no security deposit required. Obviously there is a catch. What is the monthly fee on this card? Jim D: There is a monthly fee, it is $7 a month and that’s the only fee associated with the monthly use of the card. Doug H: So, even if I don’t use it, even if I don’t borrow any money, I’m paying $7 a month. What is the interest rate if I have a balance owing? Jim D: The annual interest rate on the card is 28.8%. Doug H: So, just under 29%. So, okay so let me play devil’s advocate here. Every bank in Canada has a credit card and the typical interest rate is I don’t know 19% or lower, and most basic credit cards have no monthly or annual fee. So, why should someone consider your card which has a higher interest rate and has a monthly fee? Jim D: I think that’s a great question and it’s one that I’m happy to talk about and it’s one that we’re very open about with our customers. The reason our rates are a little bit higher than the bank is simple. We’re not a bank. We borrow our money from the bank. So, our cost of funds are automatically a little bit higher than the bank. And in addition we are also taking on some additional risk in order to provide our service, which the bank isn’t able to provide. So, it costs us a little bit money and that is reflected in having a monthly fee. But I do want to be really clear. We’re not suggesting that we’re trying to compete with the bank. We’re offering a very competitive rate product to people where they’re not able to get financing from a bank. And in fact, part of our conversation with our customers is, when you can get traditional financing or you can get a card with a different interest rate at a bank, we encourage that, and we support that by not having any fees associated with paying the card out early or paying a loan – more specifically paying a loan out early. We don’t have fees associated with that. We want people to get the best rate they can. When they can’t we think we’ve got a very competitively priced product. 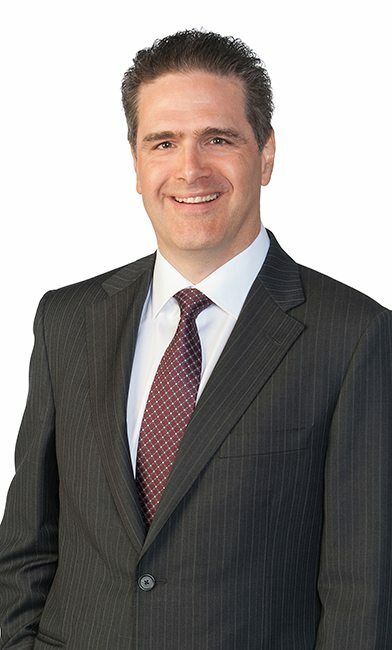 Doug H: So, you think your typical customer will only be with you for a limited period of time during their bankruptcy, maybe for a year or two or three after their bankruptcy is finished or until they’ve re-established their credit in some other manner. You don’t expect you’re going to have anyone with this particular card for 10 years is that correct? Jim D: Well, I think that’s absolutely the way to look at it. The card is there at a time when you need to start either establishing credit or you need to re-establish credit. It is a transaction based card so you use it for daily transactions we mentioned earlier, renting a car, booking a hotel, buying something online. It really is designed to be a daily transaction card. The idea is that you pay it off every month. We keep the limits very manageable. And when you can find a card that’s cheaper, that’s absolutely what we would promote. Doug H: It still sounds kind of to me that you’re kind of taking advantage of people. So, a normal credit card rate would be maybe 10%, 15%, 20% with no fee, with yours, you’re paying $7 a month. So, even if I don’t use the card that’s still $84 a year. Wouldn’t I be better off taking that $84 putting it in a savings account so at the end of the year I’ve got $84? Go out and use that money, go out and use that money to start re-establishing your credit. It’s – again, it seems to me like such a high number. Do you perceive that you are taking advantage of people? Jim D: Absolutely not. I think that the price is really designed to be there to provide a facility and utility for someone to have a credit card. There are secured cards out there. This is actually a credit card. This is a real credit card. It has a real credit limit assigned to it. It has an ability for you to use it and to gain credibility at the credit bureau for purposes of your credit reporting. We report all credit payments to the credit bureau, and it is a $7 fee a month, but we kind of look at it as for $84 a year you have the utility of a card, you have access to actual unsecured credit card and you’re building credibility with every payment you make on it to support your credit bureau score. Doug H: Well, and that’s another good area to talk about then, building your credibility, supporting your credit score. I’d like to talk more about that and I’d like to hear your thoughts on, okay is this really building my credit score or is that really just more of a sales pitch you’re making? But before we talk about that let’s take a quick break and we’ll come back and talk about whether or not a credit card like this can actually help improve your credit score. We’ll be right back. I’m talking to Jim Dunbar of Affirm Financial; you’re listening to Debt Free in 30. Doug H: Welcome back. I’m talking today with Jim Dunbar who is with Affirm Financial Services. They offer a credit card that people can get even if they are bankrupt, even if they’re in a consumer proposal or even if, for whatever reason, they have very challenged credit. And before the break we were talking about the parameters of this card: there’s a $7 monthly fee, the maximum credit limit is $1,000 if you are bankrupt at the time you get the card, the credit limit will increase (or can increase once you’re discharged from your bankruptcy), and there’s also an interest rate of 28.8% if you’re carrying a balance every month, which I think kind of defeats the purpose of a credit card like this, but that’s the perimeters. So, I said to Jim before the break, that’s awfully expensive isn’t it? And he said, yeah it’s expensive but there are number one, not a whole lot of options if you need a credit card while you are bankrupt cause you need it for work you need it to book hotel rooms then this an option. So long as you pay it off every month the cost is $84 a year for that credit card. You’ve got to decide for yourself whether that makes sense. Now the other point that Jim made just before we went on break was that this also actually helps you improve your credit score. So, let’s talk about that. And maybe we can start with some basic definitions here. What are the kind of things that go into your credit score? And I know Jim, you’re not a representative of Equifax, neither you nor I know their secret formula, but give me a bit of an overview of the types of things that go into a credit score and then we can bring it back to this card in particular. Jim D: Sure. Well, I like this question and you’re right. I’m not representing the bureau on this answer, but I can tell you about some of the specifics that do drive the score. It’s a difficult question to answer but it is one – and it’s difficult cause it calculates so many different variables and it’s very specific to an individual’s actual credit information. So, there are a lot of different calculations that go into it. But to give you some examples it looks at things like the length of time that you’ve been on the credit bureau, looks at things like payment history, it looks at how long that payment history has been in effect. It looks at very unique demographic information, specific to the individual. It looks at things like recent inquiries, where financial institutions may have been or whether or not the person has been seeking credit. It looks at – a very important one is utilization of credit. So, it does a calculation and looks at of the credit that you have available to you, how much of it have you used and how well are you paying it back as per the terms? So those are examples of the kinds of things that really can impact somebody’s score and so there are a lot of calculations but those are the kinds of things that people can be aware of. Doug H: Okay, and we’ve talked before on this show about credit scores and how they work. And I’ll put some links in the show notes to some of that information. So, okay we understand there’s a bunch of parameters that go into it, do you have any evidence that your specific card actually helps? I totally agree with you, the longer my payment history the better my utilization, the better my credit score but what about your card in particular? Do you have any evidence that your card actually helps people improve their credit score? Jim D: Well again, I think it’s important to note that it’s one variable in a series of quite a few calculations. But we did do a sample of 2,000 of our accounts. We looked at accounts that were in bankruptcy or some that had been recently discharged and we took a sample of 2,000 accounts dating back to 2012. And we looked at those accounts and we were very pleased to see that over 65% of those accounts in that category had a score range of 675 or better. What that score really means is, the banks kind of look at between 700 and 675, 680 as where they have a cut-off if you want to call it that. That’s a range I’m guessing a little bit, that’s about where they are. 65% of the accounts that we looked at in that very short amount of time, had now achieved that rate. And we know that part of that process is impacted by the fact that they had an active credit card with us that they were paying according to the term. So, they were paying it well and their scores were going up. Now there were other factors but it’s a really good indicator. 43% of those accounts were up over 700 so that is a really impressive improvement for those accounts, which we know can have, or were having some impact. And I think what’s important is we’re trying to give people the ability to start making that impact sooner. So, while people are in bankruptcy they’re using that card and they’re getting that benefit and they’re creating that history. And I think that’s a really important distinction about what this card can do because it really is trying to get the process started earlier. Doug H: Do you have any knowledge of what the person’s credit score would have been prior to starting? So, what you’re saying is we looked back and somebody who got our card a year or two ago may very well have a credit score of 700, which is starting to get into a decent range. But, did that person have a credit score of 700 two years ago anyways? Do we have any way of knowing whether the card was actually a contributing factor to that? Jim D: Well, I can assure you that all – they’re very unique, but it’s very difficult for me to give you that level of detail, because we have to aggregate the results. But that said, I think there would be very few to any that would even have been anywhere near that range. Because of when they applied for credit, their credit scores were actually quite low. They were as low as four or five or low 600’s, most on average. So, really we’re talking about accounts that probably had very poor scores that actually made some pretty dramatic improvement. Doug H: And I understand that obviously you’re not going to release individual client information here, that’s not possible. But what you’re saying is you’ve taking a sample of a couple of a thousand people and you took a look to see – well, you know roughly what their credit scores are when they start the program because they are either in bankruptcy or just out of bankruptcy, they’re in a consumer proposal or for some other reason they have not great credit. And those people would typically have scores of you know, 400, 500, high 500’s maybe into the low 600’s. And by the time a year has gone by, or two years have gone by, obviously being discharged from bankruptcy is going to have a positive impact on their score, but a significant chunk of those people now have a credit score of 700 or higher. That’s what you’re saying. So, does having a higher credit limit matter? So, I can go out and get a secured Visa card for, you know, let’s say with a $500 limit. I can get your credit card even if I’m bankrupt up to $1,000 limit. Once my bankruptcy is finished the limit can increase. Does size matter when it comes to the outstanding availability on your credit card? Jim D: Yeah, I think I’ll answer that question; the answer is: yes it can have an impact. And I think the best way to describe it probably would be with an example. So, if someone has $1,000 credit limit and on average they carry or use $500 of that in a particular month or on average that’s what they use, their utilizing 50% of the credit that they have available. If somebody had that same payment pattern, and they had a limit of $2,000 on the card, now they’re using half of that (so 25% of the available credit). And what the calculation is really looking at is a bit of size matters so it does matter what the limit is and then, but a more important calculation is really how much of what is available to you have you used and I think that – so limit can make a difference, but it is consistent with if your spending habits stay consistent. And that’s probably the better way to approach that question. Doug H: Yeah and we don’t know what the exact formula is with the credit bureau, but the people I’ve talked to have told me that, yeah utilization of 20% is a lot better than a utilization of 80%. So, the bigger amount of credit that you have access to, but you demonstrate you’re responsible by using only a small portion of it, therefore makes a difference. So, I guess the concluding comment then in this segment would be that the $84 a year that it’s going to cost me to pay the $7 monthly fee on a $1,000 credit card is actually also helping improve my credit score longer term. Is that essentially what you’re saying? Doug H: Okay, well that’s very helpful information. I know you also have a term loan product. And we’ve only got about a minute here but the term loan product is something once you’re bankruptcy or once your consumer proposal is finished. Is that correct? Doug H: And the maximum you can get on that term loan would be how much? Jim D: It would be $5,000. Doug H: And the interest rate on that would be how much? Jim D: Those interest rates also start at the 29% range. Doug H: And could be a bit higher than that. And what’s the monthly fee on those loans? Jim D: There are no monthly fees. So it is just an annual percentage rate and I think what’s worth noting on these, these are also unsecured loans and they are open, they have a term to them, but if someone would like to pay it sooner or pay it faster than the term there are absolutely no penalties to that. So, if someone can borrow the money at a better rate throughout that term, we encourage them to take advantage of that and there are no penalties associated with paying it sooner. Doug H: And in effect you’ve already said that in the first segment what you’re really trying to do is get the person into a better position. And you assume that five years from now they’re probably not going to be your client anyways because their credit will be such that they can borrow at a better rate. So, I think that’s a great way to end this segment. Jim, thanks for being here today. Jim D: Thanks very much for having me. Doug H: Great thanks very much. We’ll be back to wrap it up right after this on Debt Free in 30. Doug H: Welcome back. It’s time for the Let’s Get Started segment here on Debt Free in 30. 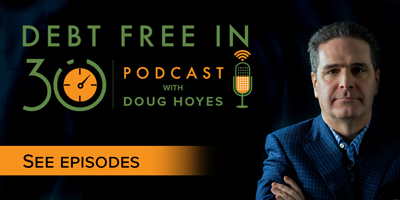 My name’s Doug Hoyes and my guest today is Jim Dunbar of Affirm Financial Services. His company offers products to help people rebuild their credit and one of the products is a credit card. The credit card carries an interest rate higher than what you’re going to get at the bank. It also carries a $7 a monthly fee, but it’s a fully unsecured credit card, meaning you don’t have a security deposit and you can get this credit card as soon as the bankruptcy starts. Now what I want to talk to you about in this segment, Jim, is what is your advice to somebody who wants to rebuild their credit, because this is kind of the common question I get from everybody. Okay, I’ve had issues in the past, I lost my job, I went through a marriage separation or divorce. I had some medical issues, I had to go bankrupt but I want to get back on track again. Someday I would like to buy a house, finance a car. I want to have access to credit. So, what are the steps that need to be taken? And obviously, the obvious steps are well you’ve got to cut your expenses so they’re below your income; you’ve got to be saving money and things like that, but to build up your credit you have to have things on your credit report. And as we talked about in the previous segment, time matters. So, what in your mind then is the first step? Would it be to, perhaps after you’ve built up a bit of savings or something in your bank account, would it be to get one of your unsecured credit cards? Jim D: Yes, I think the very first thing I think is to understand what is an affordable monthly payment for you and what’s the right kind of credit? I think a credit card would be a great place to start. The important thing is, the sooner you start, the sooner you start to improve the benefit of having- establishing new credit and making the monthly payments. The second probably most important thing is that you use the card within the means that you’ve established so that you are paying the credit back and paying either the monthly payment or the entire balance off every month, so that you’re continually getting that credit and helping to establish yourself back at a credit bureau. Doug H: Yeah, and my advice of course is going to be okay I understand why a credit card may be necessary; you need to have a credit card to book a hotel room to do other things, and you also want the added benefit of having it begin to rebuild your credit, so that kind of makes sense. I am not a big fan of carrying a balance on a credit card whether you’re bankrupt or not, whether you got lots of money or not. I don’t think that’s the way you should be borrowing. Obviously, your business model is such that well yeah we don’t mind if people are carrying a balance so long as they’re making the minimum payment that’s obviously how you enhance your revenue. So, I get the credit card at the end of my bankruptcy, what happens then? So, I’ve been paying my credit card every month doing a great job, at what point then am I able to increase the limit on that card? Jim D: The limit can be increased once someone is discharged for bankruptcy. So, we’ve set up the program where we’ve tried to offer a limit that provides value for the purposes of transactions, but once out of the discharge we’re able to look at it and apply a different approach to the credit limit. I also want to – I do agree with you, credit cards are not designed to be a means of borrowing and I think it’s really important that people think about a credit card for the purposes of a transaction and they pay if off every month. And I think that’s probably the most important part of this message. Once someone comes out of that process, there are means and people would like to have a higher limit and that’s where we approach things a little differently and we have limits for both the loans and cards once someone comes out of discharge that are higher. Doug H: Yeah the credit card should be a substitute for cash, it shouldn’t be a substitute for borrowing. That’s what it’s there for. Doug H: So, my bankruptcy ends. I call you guys up, maybe you bump my credit limit up to $1,500 or $2,000 or whatever, and am I still paying the same $7 monthly fee or does that go up? Jim D: No, that rate stays the same. And what we are able to do is start to look at, based on credit payment performance and where you are in that process, a higher limit. Doug H: And at that point then I could also apply for a term loan so that I then have two different things in my credit report and so that I have higher credit which then factors into the whole utilization category we talked about. So, at what point would someone be able to apply for a term loan? Jim D: Yeah once they’re discharged from bankruptcy you can apply for the term loan. And I think the term loan really is designed to provide a short-term cash need that has an end date in sight. So you borrow the money with the idea that at a specific term you pay that money off. Doug H: Yeah, the goal is not to have a loan that’s going to be there forever. Maybe it’s okay I’m going to borrow the money and I need to buy a really inexpensive car, I need to do some car repairs or something specific. So, I have the loan for a year or two years whatever, but I get it paid off and hopefully at that point in time once it’s paid off my credit is therefore better. Is that really the whole concept? Jim D: Yeah, that’s the whole concept and both credit facilities do help to provide you with improvement in the credit score. Doug H: Yeah, so I guess the advice for people then is crunch the numbers, I’m certainly not going to tell you you should get a credit card or a loan or you shouldn’t. You’ve got to look at your own individual circumstances and decide what’s going to make sense for you, great, thanks very much for joining me today, Jim. Jim D: Great, thanks again. Doug H: We’ll be back to wrap it up on Debt Free in 30. Doug H: Welcome back, it’s time for the 30 second recap of what we discussed today. On today’s show Jim Dunbar explained the features of their credit card product for people who are in bankruptcy or who don’t qualify for a credit card from a traditional bank. That’s the 30 second recap of what we discussed today. As I said during the show, these credit cards carry a monthly fee and a high interest rate. So you should only get one if you have no better options and you will be disciplined enough to pay it off every month and to replace it with a less expensive option once you’ve rebuilt your credit. Doug H: That’s our show for today. Full show notes, including links to the products we discussed on today’s show are available on our website at hoyes.com, that’s h-o-y-e-s.com. Thanks for listening. Until next week, I’m Doug Hoyes. That was Debt Free in 30. How long does it take to get my credit back after bankruptcy? Bad Credit Debt Consolidation Loans: Are They Worth It?